I'm a bulgur newbie. I found this great cracked wheat only about two weeks ago. I was quite bored with couscous and wanted to try something new. Unfortunately I did not find a quinoa in a common supermarket in London. I guess I have to try some health food shops. However bulgur wheat made a sufficient replacement to quinoa for now, and I took a liking to it. First I tried a mint and parsley salad recipe from my cookbook Easy Mediterranean. We had friends over for the weekend and we split on the issue of this salad. We were three who liked it to one who did not, so it was a victory for me :) They all were a bulgur newbies same as me. For me, bulgur was a pleasant new discovery for my daily menu. In fact I liked it so much, that I cooked it again just two days later. This time I wanted to experiment on my own. I got delicious plum tomatoes at the market just a few days ago. And lady selling them told me they were delicious roasted just with a garlic, salt and olive oil. I had a craving for it for couple of days already. 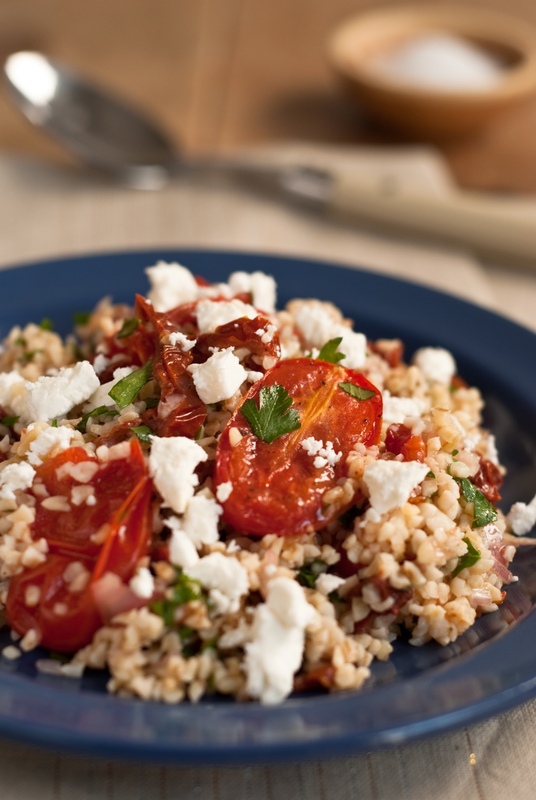 It seemed like a ideal connection - bulgur and roasted tomatoes. 1 Preheat the grill to high heat. 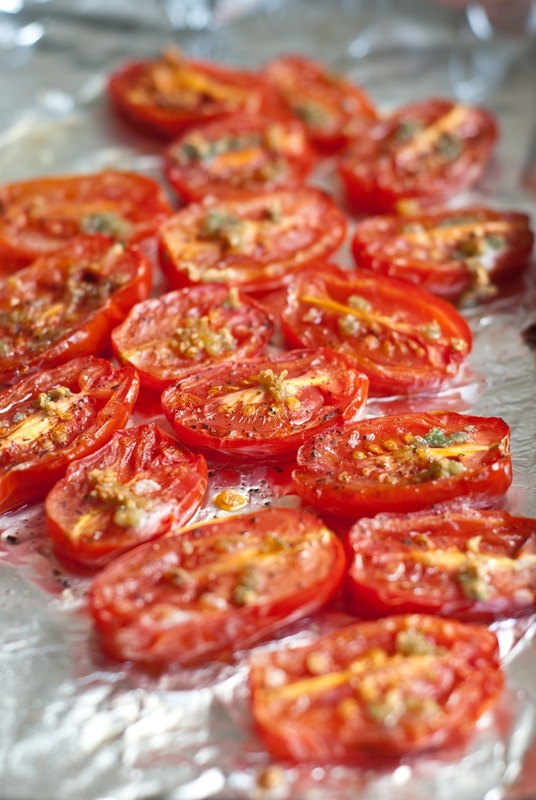 Place the tomatoes, cut side up on a lined baking tray. Sprinkle with salt, pepper and garlic, drizzle with olive oil. Place under the grill for 15-20 minutes. Let cool them down. 2 Meanwhile put the bulgur in a small pot or bowl and cover with boiling water just below the surface of the wheat. Let stand for about 15-20 minutes to absorb the liquid, until just tender but still quite al dente. Add more water if needed or drain any excess liquid in a colander. 2 For the dressing, whisk the olive oil, vinegar and lemon juice in a small bowl, season to taste with salt and pepper. 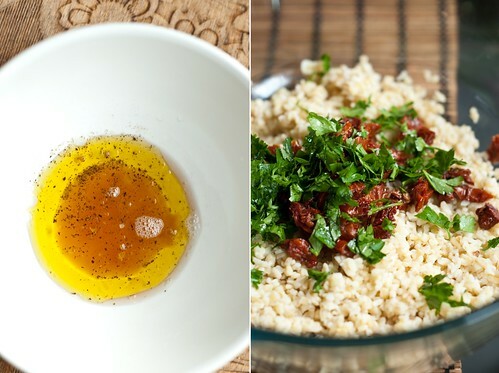 3 Mix the bulgur, shallot, sun-dried tomatoes and parsley in a bowl, pour over the dressing and check seasoning. Add the grilled tomatoes. Sprinkle with feta cheese.